Get your own Rolls-Royce themed weathervane for your house, garden or shed. 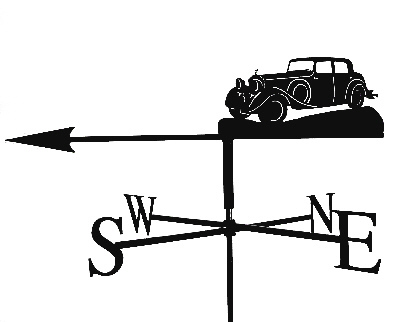 This stylish Rolls-Royce 20/25 weathervane is fully tested to ensure that the majority of the weight is at the front (the arrow) and the majority of the surface area is at the back (the design). When this bar is balanced correctly, the weathervane will spin so that the arrow points into the wind. Measures approximately 61 cm across the cardinal points and is designed for a standard size house or larger shed or garage. £220. The design is cut from 2mm mild steel and is electroplated to produce a solid black matte finish. All fixtures and assembly instructions are supplied. A great lasting functional gift which will impress every visitor. NB. As all the weathervanes are individually produced to order on a bespoke basis, please allow a delivery time of up to 28 days after the confirmation of your order. Payment option. To pay in full now, proceed with your order online below. Alternatively, if you would like to pay a 50% deposit now and the remainder on completion of your nameplate, please call the telephone number above. Current average production time: 28 days. (A photograph will need to be supplied). Make your weathervane stand out even more. The letters (N,E,S and W) can be gilded using 23.5 carat gold leaf. It is weather resistant, and unlike gold paint, will not dull over time. The process is done to a professional standard, with a coat of primer and 5 layers of paint underneath forming a high quality base for the oil based size (glue) and gold leaf to adhere to. See the example below. Only £50 extra.